We are very proud to announce the immediate release of AppTweak 3.0, the new version of our App Store Optimization tool. Our whole team has worked very hard on this release which includes a large number of new features, major improvements and a new design. Details and explanations below. We listened, listen and will listen to you! Every day, we receive a lot of suggestions from our users or from random visitors. Some of these suggestions would take longer to realize than others. Some are unrealistic for the present time. But for the biggest part, we always try to take them into account in the development of our ASO tool and its future releases. Today, we are thrilled to present you to AppTweak 3.0, a simplified – but more powerful – version of AppTweak. Our main objective was to amplify this notion of App Store Optimization Report. To recap, this ASO report is a complete automated and personalized review of all the ASO factors of your app. It is instantly generated right after you typed the name of any app from the Apple App Store or Google Play Store. In just a click, the ASO of your app is entirely reviewed and scored; your app’s strengths and weaknesses are pointed out along with easy to implement recommendations. In this new release, we’ve included as much data as possible in the report and we’ve included more features. Competition monitoring is highly recommended in any app marketing strategy. It is important to be aware of how your market is actually evolving and how your competitors are working. We have drastically facilitated your job here. 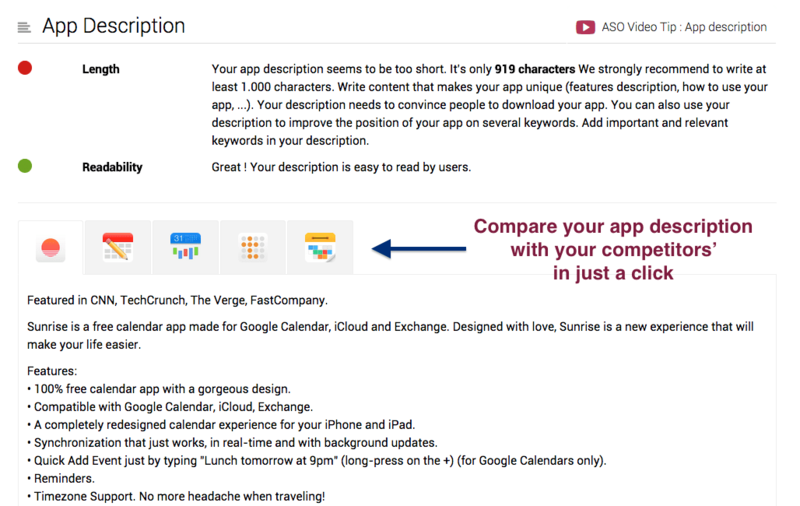 You can now add any competitor you want directly from your ASO Report. But that’s not it. Each of the competitors you’ve added will be displayed in every section of your ASO Report. You will then be able to compare all your ASO factors with your competitors’ without the need to switch windows. 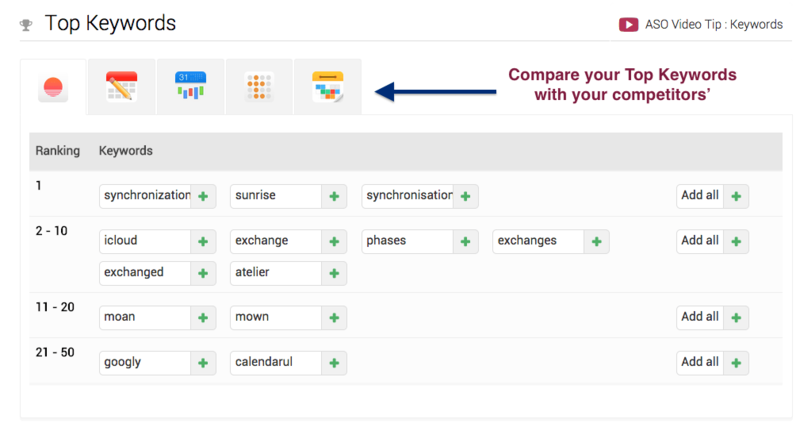 This means that you can now compare your app icon, app name, description, trends and rankings to any of your competitors on the same page. This is an extremely easy and pleasant way to make an insightful comparison between you and your competitors. It can actually be very time-consuming to monitor your competitors manually. With the new AppTweak, you’ll be able to save some precious time! As you probably already know, keywords are extremely important in ASO. However, finding the best ones is not always easy. In this new release, we focused a lot on improving our Keywords Tool and its accuracy. We worked on tweaking our algorithms hoping to provide you with the best data estimation possible. Moreover, we’ve added a list of “Suggested Keywords” coming from multiple sources and that are potentially interesting to target. To build this list, we took recurrent words from your app description but also from your reviews and ratings, media mentions and even from your competitors. Therefore, the more competitors you add in your report, the more Suggested Keywords you’ll get. Another massive improvement we made to AppTweak is the reviews and ratings analysis. Not only AppTweak now displays all the reviews and ratings coming from any app in 60 different countries, it now goes further and displays them day-by-day up to the last 30 days. That way, you’ll be able to evaluate the appreciation of your app among your users in just a click. It’s important to take every remark or suggestion into account in order to improve your app. 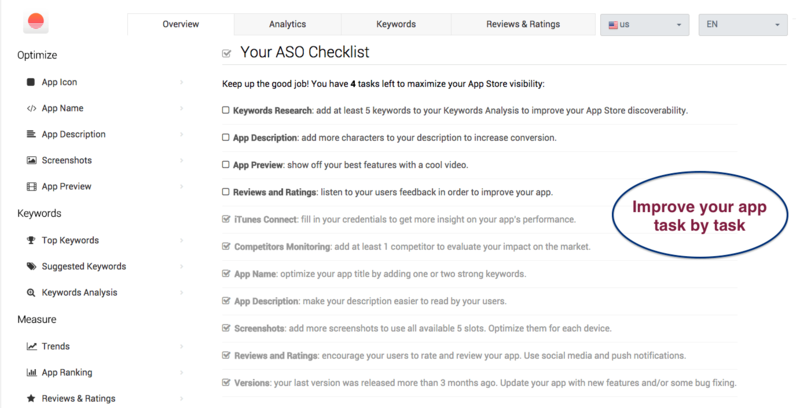 Our last but not least major new feature is the ASO Checklist. This list includes all the various ASO factors that should be optimized in order to improve your App Store visibility. For each recommendation you follow, your “task” will be considered completed and your ASO score will increase. This list gives you a rapid but complete overview of your ASO performance. However, this checklist is not static and old completed tasks could become “undone” after a few days or weeks. It is therefore important to keep an eye on the evolution of your app and your competitors’. For example, it is recommended to update your app on a regular basis. It’s also necessary to get fresh app reviews so it’s always great to encourage your users to rate your app regularly. Finally, your app keywords should always be optimized according to the trends of the market and according to how users behave on the store. ASO is an ongoing process and should constantly be worked on and part of your app marketing strategy. Aside from these 4 new features, we’ve entirely changed the design of our ASO platform. We made it simpler, without any bulky details. Also, we’ve added the app icon feature, allowing you to see any app’s icon colors. We’ve also added more general data in the app overview such as the support of Passbook or the in-app payments details per app. 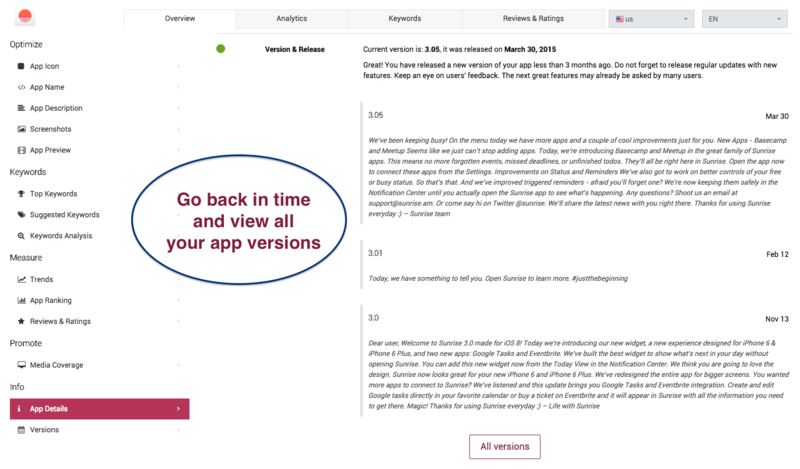 Finally, we now review all your various app versions so that you can easily remember when and how your updated your app in the past, as well as your competitors. Please, give us your feedback! As you can see, this new release is quite huge as it includes a lot of new things on AppTweak. We sincerely hope that you will like it and find it useful in your ASO work. It would be awesome if you could send us your feedback and suggestions on our new version. It really helps us improve. Don’t hesitate to reach out by clicking on the small question mark at the bottom right of every page. Enjoy the new AppTweak 3.0! What do you think of our new features? What would you love to have on an ASO tool? Leave your suggestions in the comments below, thanks!